He's a sly dog, that Snoop Dogg. Earlier this week, he and Matthew McConaughey appeared on Jimmy Kimmel Live! to discuss their stoner comedy movie The Beach Bum. The actor revealed that during one scene, he smoked what he thought was a prop joint filled with oregano, but discovered midway that it was actually real marijuana, courtesy of his cannabis-enthusiast co-star. 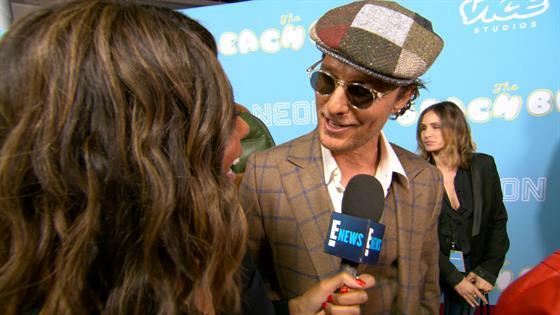 "I thought it was oregano," McConaughey recalled to E! News' Zuri Hall at the movie's recent premiere. "Seven minute take and about six minutes into it, I was like...I was already vibing but the floor started to have some different frequencies. I remember feeling like...I'm stepping on some dry potato chips...No, it was a marble floor. there was no dried grass or dry potato chips on the floor...then at the end of the cut, I find out that it was his green." In The Beach Bum, directed by Harmony Korine, McConaughey plays a stoner named Moondog and Snoop plays a rapper named Lingerie, or Rie for short. The film also stars Isla Fisher, Zac Efron, Jonah Hill and Martin Lawrence. The Beach Bum is now in theaters.